With the abundance of marketing involving sustainable products and services, a common reaction to sustainability is “how much is this going to cost me?”. Fortunately, energy efficiency is the right financial decision regardless of the value you place on sustainability. This generally applies to personal investments in efficiency as well as societal investments in energy efficiency programs. This blog focuses on the benefits of societal investments in efficiency through energy efficiency programs. If your neighbor implements an efficiency project, you save money. The fact is that as enough people implement efficiency projects, the cumulative effect can delay or often eliminate the need for additional power plants. Since power plants are very expensive and ultimately funded by ratepayers, this delayed or eliminated investment saves everyone money. Consumers of energy (ratepayers) pay for energy resources by purchasing energy. The cost of energy supports ongoing expenses of generating and transporting energy as well as development of new resources (power plants). If we can reduce our consumption of energy rather than increasing our supply, this conservation resource is equivalent to the supply resource of a new power plant. Given the equal value of conservation and supply side resources, it becomes a simple decision to prioritize the development of the lower cost resource, regardless of whether it’s a supply side or conservation resource. Most energy efficiency resources are lower cost resources than supply side resources (new power plants). Preserves lower rates. Remember, efficiency is the lowest cost resource that ratepayer funds can develop. Incentives and technical support can help ratepayers identify and implement efficiency projects that reduce energy expenses. 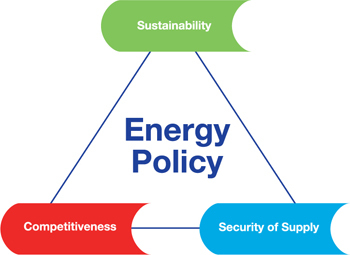 Helps achieve energy independence – efficiency is a domestic resource. Reduction of environmental impacts – efficiency avoids the environmental impacts associated with power generation such as use of fossil fuels and emissions. In addition to preservation of lower energy costs, conservation provides immediate budget relief through on-going cost savings to the consumer. This in turn strengthens businesses, provides jobs and allows households to enjoy more money available for other amenities. The bottom line is that the use of ratepayer funds to support energy efficiency is a practical decision, not a political one. Even excluding social or environmental impacts, the benefits exceed the cost, making it a decision that could be supported by everyone regardless of political association.